Animals depend on predictions about the near future to react and act in a timely, situation-appropriate fashion. 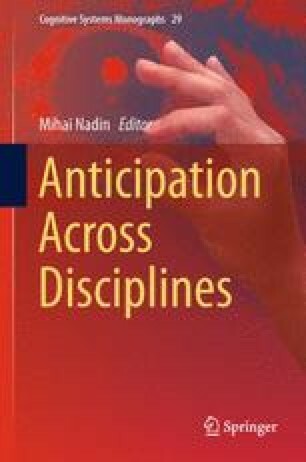 Prediction is particularly challenged in the face of events: these entail a stimulus whose temporally directed structure is meaningful in itself. Many simple events, e.g. regular motion, can be predicted by means of dynamic-forward extrapolation. For this class of predictions, the premotor-parietal network is active which we also need to plan our own body movements. However, when it comes to complex events such as action, speech, or music, we additionally need to retrieve semantic and episodic memories in order to feed and restrict the required predictions. These processes are reflected in activity of functionally specialized brain networks, as outlined in the present article for the case of action prediction. Here, knowledge about objects, rooms, and actors is exploited, but also action scripts that account for the actions’ probabilistic architecture. Smiles, walks, dances, weddings, explosions, hiccups, hand-waves, arrivals and departures, births and deaths, thunder and lightning: the variety of the world seems to lie not only in the assortment of its ordinary citizens—animals and physical objects, and perhaps minds, sets, abstract particulars—but also in the sort of things that happen to or are performed by them . The fraction of an action is more than a movement .